Kevin Sawka wears many hats in the Prince Rupert community because he wants to teach kids the sport of basketball that he loves. Prince Rupert resident Kevin Sawka is involved in basketball from beginning to end in this community. Kevin Sawka is nothing if not passionate about basketball and giving back to the community that raised him. It’s why he devotes most of the hours of his week to passing on his knowledge to the next generations. You may know Sawka as the phys-ed teacher at Charles Hays Secondary School (CHSS). Or you may know him as the teacher of the basketball course at the school, or even as the junior boys’ basketball coach. Maybe you know him as the coach of two teams in the Prince Rupert Minor Basketball Association (PRMBA). But it’s all worth it to this proudly born-and-raised Prince Rupert resident. For him, it’s about seeing the kids he coaches grow and improve. “The level of improvement and confidence that you see grow with these kids and being able to pass on that passion and share that passion with another group of kids is really what it’s all about for me,” he said. Sawka is entering his sixth year as a teacher at CHSS. Previously, he worked at Prince Rupert Secondary School for 10 years before the two high schools became one. He spent the first decade teaching social studies and geography, then social studies and physical education for five years. This year is his first as a full-time phys-ed teacher and he’s loving every minute of it. 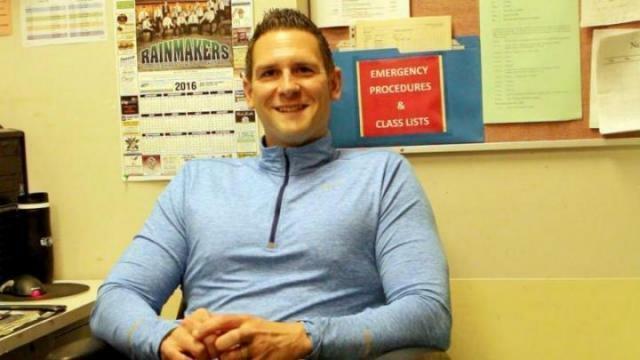 Once the basketball season starts up, it will be the 17th season for Sawka as head coach of the junior boys basketball team. Something he loves about coaching this sport is that it’s always evolving. “It never ceases to amaze me the amount of stuff there is to learn about the game of basketball,” said the coach, who attends basketball and coaching clinics every year to keep learning and improving himself. This year, the team will look to improve on last year’s 26th placing at the BC High School Basketball Provincial Championships. While he played many different sports as a kid, basketball is the only one he came back to. He played on the high school teams and then in intramural leagues while attending Simon Fraser University, but eventually his playing days had to be cut short due to requiring surgery on both of his knees. It’s what he considers his greatest obstacle. “Having to deal with and coming to terms with not being able to play basketball anymore was pretty crushing,” Sawka said. He fought his doctors advice not to play anymore until finally the pain was no longer worth it, leaving coaching as his only way left of connecting with the sport. But as much as he loves basketball, it’s about more than just the game. One highlight that sticks out to Sawka is the 2007 season. The Rainmakers finished tenth at provincials, but it was the last time that his brother was his assistant coach. In a way, Sawka is involved at the beginning and the end of basketball in Prince Rupert. He coaches two teams of kids for PRMBA, one in the Grade 3-4 division and the other in the Grade 5-6 division. He is also division coordinator for both these age levels. But then he coaches the Grade 9 and 10 students at CHSS and his basketball course included Grades 9 through 12. He is making his mark on Rupert kids, imprinting basketball on them until they graduate and choose to either pursue it at a varsity level or be content with what they’ve attained. Another part of why the friendly teacher loves all the different ways he is involved in Rupert basketball is because it’s a way for him to give back. “I feel a strong sense of wanting to give back because all of the people in our community that I still see around, put a lot of time into the different sports when I was a kid,” he said. Sawka specifically mentioned CHSS senior boys’ basketball coach Mel Bishop and the late Bob Quast as big influences on him. Although the sport is well and alive in Prince Rupert, Sawka hopes to see the game grow even more here. Some things he would like to see are more volunteer coaches who are willing to learn, more certified referees and keeping more kids involved in the sport going into high school. He said the girls side especially sees a lot of attrition once they hit Grade 9, so he wants to see more growth there as well. Basketball is Sawka’s passion and it’s an honour for him to pass on the things he’s learned. But Sawka says none of what he does would even be possible without the people in the community who have helped, either financially or in other ways. He’s aware that everybody needs a support team and Prince Rupert has been his since day one.